I have spent a good portion of the year developing MY pantry staples, determined by what I actually eat. I mostly refill my pantry from the bulk foods section of my local health food stores. I refill the spice containers with spices bought from my local Indian Store as well as the bulk food section of my local health food store. Once I run out of Milled Flaxseed I will replace it with Hemp Hearts. I prefer to get my Omegas from nuts and fish oil pills. I put the milled Flaxseed in my smoothies, plus it does take away from the great taste just a little. You may have noticed that I now have a brown rice arsenal! 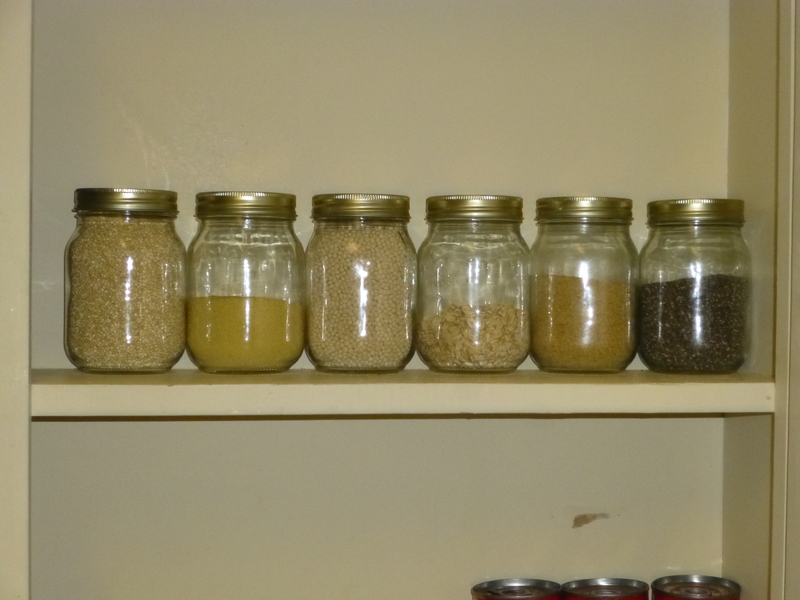 I enjoy pasta and brown rice is often a perfect side dish, so I keep it all stocked. I am in love with brown rice pasta as a healthy tasty alternative that just soaks up sauce. There really isn’t anything more important in my kitchen than my spice arsenal. There is no better way to compliment your meats, vegetables, soups, stews, etc than with spice. Like I stated above, I buy a spice from the grocery store and once that container is empty, I replace it with spices from my local indian grocery or health food store. I find that those spices have more intense flavor and the containers provided at the grocery store last forever. Plus I do not have to buy separate expensive spice jars, nope, I recycle and reuse. About a month ago I did a spice overhaul in which I wrote down my most used spices and got rid of the expired ones. If I need a spice that I rarely use, I just go buy a tablespoon or two in the bulk foods section and use it up, so that no spice in my pantry expires. Let me know if you want a full listing of my spices and how I use them. Not pictured are my stash of nuts, and cans. The cans include tomato paste, whole tomatoes, curry sauce, garbanzo beans, black beans and vegetable broth. The current nuts are sunflower seeds and almonds. I am so happy with my pantry now, it truly supports healthy habits. There is no candy stash, no sugary cereal stash, no juice stash, no cans of soup, no cans of fruit, etc. 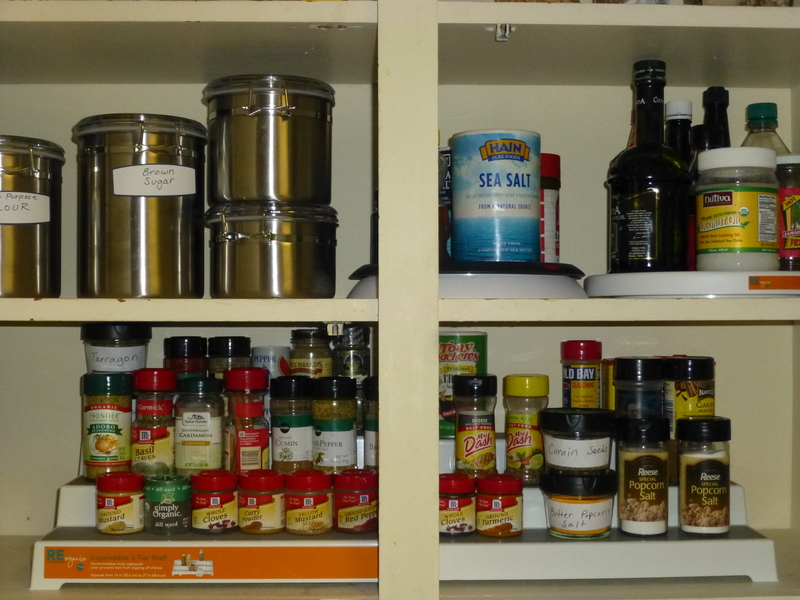 It took over half of a year, but I now have a pantry that supports healthy eating habits. I am still working on my refrigerator staples, just when I think I have a good base, I change something, that may take all year.